Using several different methods of DNA analysis, an international research team has found what they consider to be strong evidence of an interbreeding event between Neanderthals and modern humans that occurred tens of thousands of years earlier than any other such event previously documented. Today in Nature the team publishes evidence of interbreeding that occurred an estimated 100,000 years ago. More specifically the scientists provide the first genetic evidence of a scenario in which early modern humans left the African continent and mixed with archaic (now-extinct) members of the human family prior to the migration "out of Africa" of the ancestors of present-day non-Africans, less than 65,000 years ago. "It's been known for several years, following the first sequencing of the Neanderthal genome in 2010, that Neanderthals and humans must have interbred," says Professor Adam Siepel, a co-team leader and Cold Spring Harbor Laboratory (CSHL) quantitative biologist. "But the data so far refers to an event dating to around 47,000-65,000 years ago, around the time that human populations emigrated from Africa. The event we found appears considerably older than that event." In addition to Siepel, who is Chair of CSHL's Simons Center for Quantitative Biology, the team included several members of the Max Plank Institute for Evolutionary Anthropology, including Martin Kuhlwilm, Svante Pääbo, Matthias Meyer and co-team leader Sergi Castellano. Kuhlwilm was co-first author of the new paper with Ilan Gronau, a former member of Siepel's Lab who is now at the Herzliya Interdisciplinary Center, Israel. Melissa Hubisz, a Ph.D. student with Siepel at Cornell University, also made major contributions to the work. The full international research team included 15 additional co-authors. "One very interesting thing about our finding is that it shows a signal of breeding in the 'opposite' direction from that already known," Siepel notes. "That is, we show human DNA in a Neanderthal genome, rather than Neanderthal DNA in human genomes." People living today who are of European, Eurasian and Asian descent have well-identified Neanderthal-derived segments in their genome. These fragments are traces of interbreeding that followed the "out of Africa" human migration dating to about 60,000 years ago. They imply that children born of Neanderthal-modern human pairings outside of Africa were raised among the modern humans and ultimately bred with other humans, explaining how bits of Neanderthal DNA remain in human genomes. Contemporary Africans, however, do not have detectable traces of Neanderthal DNA in their genomes. This indicates that whatever sexual contact occurred between modern humans and Neanderthals occurred among humans who left the African continent. 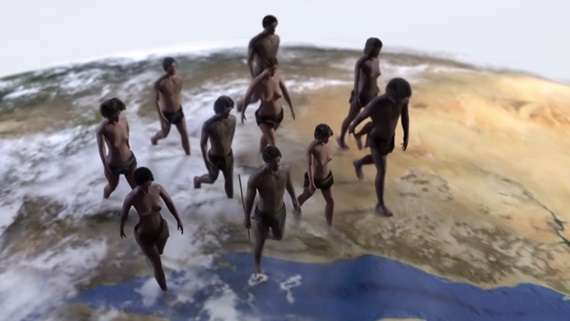 "Ancestors of present-day African populations likely didn't have the opportunity to interbreed with Neanderthals, who lived largely outside of Africa," explains co-author Ilan Gronau. The team's evidence of "gene flow" from descendants of modern humans into the Neanderthal genome applies to one specific Neanderthal, whose remains were found some years ago in a cave in southwestern Siberia, in the Altai Mountains, near the Russia-Mongolia border. The modern human ancestor who contributed genes to this particular Neanderthal individual - called the "Altai Neanderthal," and known from a tiny toe bone fragment - must have migrated out of Africa long before the migration that led Africans into Europe and Asia 60,000 years ago, the scientists say. In contrast, the two Neanderthals from European caves that were sequenced for this study—one from Croatia, another from Spain—both lack DNA derived from ancestors of modern humans. The team also included in their analysis DNA from another archaic human relative, a Denisovan individual, whose remains were found in the same cave in the Altai Mountains. Denisovans, like Neanderthals, are members of the human line that eventually became extinct. Both of these archaic human cousins lived in the same cave, although at different times in the past. The Denisovan analyzed in this study did not have traces of modern human DNA, unlike the Neanderthal found in the same cave. That doesn't mean modern human ancestors never mated with Denisovans or European Neanderthals. What is does mean, Siepel clarifies, is that "the signal we're seeing in the Altai Neanderthal probably comes from an interbreeding event that occurred after this Neanderthal lineage diverged from its archaic cousins, a little more than 100,000 years ago." The modern human sequences in the Altai Neandertal appear to derive from a group of modern human ancestors from Africa that separated early from other humans, about the time present-day African populations diverged from one another, around 200,000 years ago. Thus, there must have been a long lag between the time when this group branched off the modern human family tree, roughly 200,000 years ago, and the time they left their genetic mark in the Altai Neandertal, about 100,000 years ago, before being lost to extinction themselves. The team's analysis included more than 500 genomes of contemporary Africans. "I was looking to see if I could find genomic regions where the Altai Neanderthal has sequences resembling those we see in humans," says Martin Kuhlwilm. "We know that contemporary non-Africans have traces of Neanderthal in them, so they were not useful in this search. Instead, we used the genomes of contemporary individuals from five populations across Africa to identify mutations which most of them have in common." This was the data that provided evidence of "regions in the Altai Neanderthal genome that carry mutations observed in the Africans - but not in the Denisovan" or in Neanderthals found in European caves. "This is consistent with the scenario of gene flow from a population closely related to modern humans into the Altai Neanderthal. After ruling out contamination of DNA samples and other possible sources of error, we are not able to explain these observations in any other way," Siepel says. I cannot keep my hands from the keyboard...Noo. I just cannot say it.